What are “special projects”? These cover a lot of territory. Many are made possible by grants which our Library actively seeks out to fund exciting purchases and programming. Below you will see just a few of the exciting projects, present and past, at the Hamilton-Wenham Public Library. 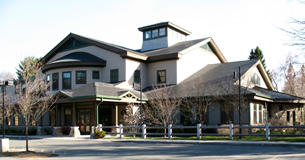 Come celebrate our 10th anniversary of sponsoring National Novel Writing Month at the Hamilton-Wenham Public Library. Click here to find out more! In 2016 residents of Hamilton and Wenham were invited to read Lizzie Bright and the Buckminster Boy, a story of friendship and adversity in early 20th century Maine. Click here to find out more! In fall of 2013, residents of Hamilton and Wenham were invited to read The Hammer and the Anvil, a dual biography of Frederick Douglass and Abraham Lincoln. Click here to find out more! Come and see our statue of “The Orphans”! This statue has a special history at our library, and was returned to us after a lengthy restoration process in January through May of 2013. Click here to find out more! In spring of 2012 the towns of Hamilton and Wenham read The Mangrove Tree, about an initiative called The Manzanar Project, which helped solve the hunger crisis in Eritrea and was the work of a Wenham resident, Dr. Gordon Sato. Click here to find out more!